HomeBlogThe new LoRaWAN™ EMB-GW1301 gateway is now available! The new LoRaWAN™ EMB-GW1301 gateway is now available! 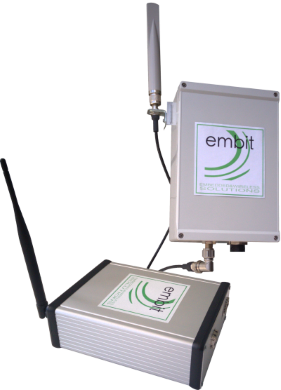 The LoRaWAN™ EMB-GW1301 gateway is the latest creation of Embit presented to the market. It is a multi service upgradable platform designed to meet IoT M2M scenarios. It enables LoRaWAN™ connectivity to the cloud, providing a cost effective solution for IoT wireless infrastructure. The EMB-GW1301 is based on the Semtech SX1301 chipset, allowing to operate on multiple channels at the same time. Thanks to the Semtech SX1301 performances and the efficient Embit RF design, the possible radio ranges are up to 15 km in the countryside and 3 km in urban areas. Network connectivity is provided by the Ethernet interface; optional radio communication interfaces (3G/4G/Wi-Fi) can be included. The EMB-GW1301 can be preloaded with a specific customer’s firmware and configuration or whit the most well known LoRaWAN™ network provider configuration. The solution includes a Full OSS system with access to a cloud service for the provisioning and monitoring of the base station and the end-devices (alarms..). The gateway is also available for outdoor usage, with POE and GPS options. The system will be provided with an IP 67 plastic case. Its duel usage ( Indoor/Outdoor version) can be an optimal solution for a numerous applications in the M2M/IOT area. LoRa Technology is ideal for battery-operated sensor and low-power applications such as: IOT, Smart Home, Smart City, Smart Water, Healthcare, Industrial Automation, Pet Tracking, Cycles Tracking, Street Lighting and all the scenarios where the extremely low power consumption and long range connectivity are needed.